To Sum It Up: The Spotted Custard is off on another adventure, this time in search of vampires in Peru. The airship’s crew must first, however, solve the rather pesky problem of a helium leak. It’s up to the Spotted Custard’s always dependable purser Primrose Tunstell to help find a way to save the day. Meanwhile, back on board the airship, Prim’s twin Percy just wants to be left alone with his books instead of dealing with the mayhem that typically follows wherever the Spotted Custard goes. 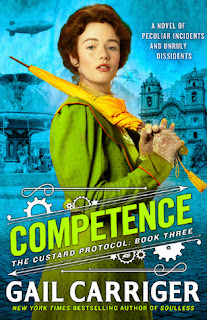 Review: It’s been a while since we last checked in with the motley crew of the Spotted Custard, but the newest installment in Gail Carriger’s The Custard Protocol series was absolutely worth the wait! I didn’t realize how much I missed this group of adorably quirky characters until I started reading Competence. The title is very fitting here, as the novel focuses on Primrose Tunstell, probably the most reliable member of Captain Prudence Akeldama’s crew. Prim is practical where Rue is whimsical, and so the two best friends balance each other out very well. Prim is also like a mother to practically everyone on the airship, and you truly get the sense that the crew is one big family. It wouldn’t be a family without some dysfunction, of course, but even with so many different personalities on board that are often at odds with one another, they’re at odds in an endearing way. Competence also puts Prim’s brother, Percy, in the spotlight. The Tunstell twins could not be any less identical, with Prim the epitome of etiquette and Percy happiest in the company of his books. I have to say, I found Percy’s pedantry and aversion to human interaction quite amusing. There were many laugh out loud moments involving just about everybody aboard the Spotted Custard, and the riotous humor is one of the reasons why I love Gail Carriger’s books so much. She has such a knack for writing witty phrases. The banter between the characters is especially scintillating. While there is a story line centered around a hive of endangered vampires in the Andes, the novel belongs to Prim as she tries to sort out where her heart seems to be leading her versus what society expects of her regarding marriage and family. Fortunately for Prim, she’s surrounded by a family that loves her for whoever she is and will always welcome her home on board the Spotted Custard. I can’t rave enough about how brilliantly the characters in this series have grown. They’re the backbone of the books, and Competence was another delightful escapade with this lovable bunch. All in All: Competence was such a fun read! Prim’s character development is the standout here. The view from Percy’s perspective is also a blast. The ending sets up the final Custard Protocol book perfectly, and I eagerly await its release!